Nothing hurts a successful garage sale excursion then rain. I am bummed when the weatherman forecasts rain for a Saturday morning because many folks cancel their yard sale. Such was the case one Saturday back in the Fall when I woke up to find it drizzling outside. When it rains I usually double check the yard sale ads looking for those that say, "rain or shine". If the fair weather yard sales wimp out, I usually can count on a few "rain or shines" to go to. On this rainy day I found one fella who consistently holds a garage sale every year. This guy is not one to sell junk either, so I made sure I stopped by. Sure enough he was open like his ad said, but his stuff was tightly crammed in his very well organized garage. (I'm jealous of guys like him) As I scanned around, he pointed out a pair of fishing waders to me that looked pretty expensive. I asked him his price and he told me he would take five bucks for them. Knowing that it could be the only thing I buy on this rainy day, and also that good quality fishing gear is always a winner, I gave him his five and scampered off. It turned out to be the only item I found that rainy day. I posted them quickly, thinking the fishing season is fast coming to an end for this year. As I was hoping, my seven day auction attracted a lot of interest. This five dollar rainy day find closed with a sale of $35. Seven times my investment;boo-yah!...a garage sale money maker! So today's garage sale tip: quality fishing waders and related gear equal a nice profitable return. 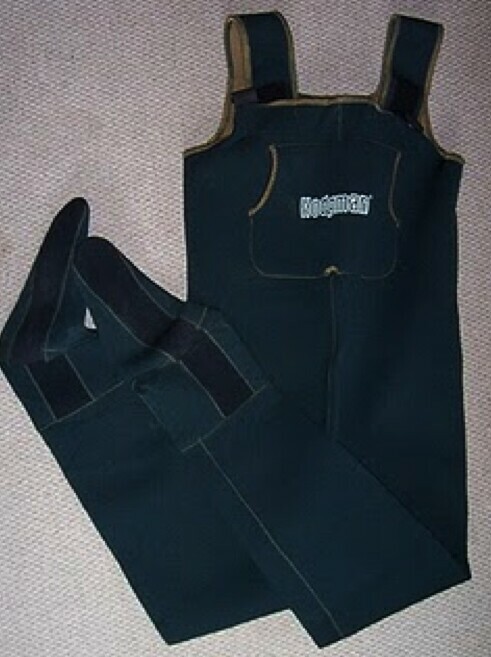 Penn Reels are another name brand "hot" fishing item yo look for. Lastly, don't let a little rain stop you from hitting the garage sales! 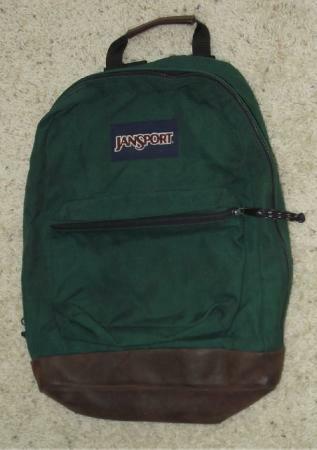 In my previous ramblings on discovering "average" yard sale finds, an astute reader kindly suggested another item to be on the look-out for...JanSport backpacks. I am familiar with these backpacks, my kids used them for years. Judging from their popularity with the school kids, it seems they're the "North Face" of backpacks. Just like North Face jackets, every school kid just has to have a JanSport backpack! They have two things going for them, they're high quality and are the "It" schoolbag to wear on your back. So parents like them because they're well constructed and kids like them for fashion. My kids use to stuff them until they were literally bulging with their schoolbooks. Despite this abuse, they always seemed to hold up well. Retail prices are not cheap, a really nice JanSport with multiple pouches will run you close to $100 new. Many parents will pay the higher prices though, rather then stick their kid with a Walmart cheapie that won't last the school year. I did some eBay research and looked up used JanSports that sold recently. Glancing through the multiple pages, I noted that the majority of them sold easily. It seems pretty clear that you won't get stuck with a no-sale, especially if you were to sell it during the Fall "back to school" season. Average prices range in the upper twenties to mid-thirties. The one seen in this picture has a very durable leather bottom and sold for $34 bucks, I'll take that any day! Even better, if you find a JanSport hiking backpack at a yard sale, you'll do even better. The camping/hiking models can easily sell for a fifty dollar bill or more! I am guessing most seller's will look at these bags as just as their kid's old book bag, setting the price for five dollars or less. If you can snag a JanSport for that price, you're looking at a nice return on your investment. In addition to finding one at the yard sales, like me you may wonder if the kids have an old JanSport stashed away in the house somewhere. I am convinced that I can find at least one, probably shoved in the back of a bedroom closet or under a bed. Look out dust bunnies...I am coming in! Thanks to my reader for this great tip. We now have another "not-so-average" item to look for at the yard sales. We are always looking for more, so let me know what items you found that brought in big cash!